While the program has been successful in motivating contributions and engagement, and recognizing valued members in the community, the time has come to evolve beyond the points, badges and leaderboard (PBL) model. In the context of the upcoming 1DX Community Experience launch, we have defined a new program to leverage the emerging best practices in reputation, advances in technology and learnings from three years of running this program. The new program is designed to encourage quality engagement, and takes a more sophisticated approach to recognizing expert contributions. It will be rolled out in phases, aligned with our agile development approach and affording members time to learn and adjust to the changes. Here’s a look at what’s coming and when. We respect and appreciate all the effort that has gone into your contributions on SCN. The points, level, and badges in your profile are the representation of your efforts and reputation, and shouldn’t disappear with Jive. We will provide a record of your accomplishments by creating a snapshot of your SCN reputation shortly before the cutover. It will include your lifetime points, level and badges, and be displayed in the new SAP Universal Profile. 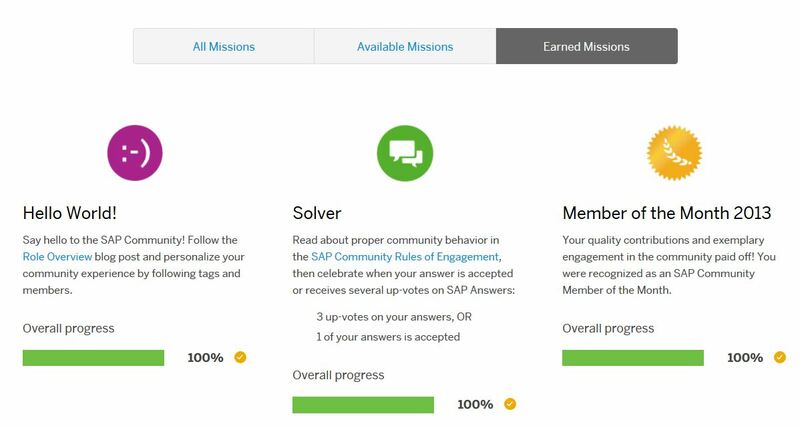 Karma credits can be earned for participation in the new SAP Answers platform. Showing you your karma credits will help you get used to the new platform, and keep track of how your contributions on SAP Answers are being received. The Karma Credits total can be found in the sub-header when you are logged in on SAP Answers, with a link to display your karma credits history, both viewable only to you. Status icons for SAP Community Moderators, SAP Mentors, and SAP Employees will continue to be included in their SAP Universal Profile, and on the content contributed. A variety of simple totals that summarize your activity, and how other community members respond to it, will be available throughout the site. The counters provide an objective summary of your activities, and include things like your follower count, total likes and upvotes you receive on posts. We are taking a phased approach to rolling out the new gamification and reputation elements, in order to give you ample time to get used to things. About a month after launch, a new set of missions and badges will await you! The mission set has been redesigned since the platform switch made some requirements obsolete (e.g., ratings are no longer supported). Missions to recognize blogging, answering questions and onboarding will be available. We are excited to leverage the flexibility of the SAP HANA Cloud Platform Gamification Service (HCP GS) to introduce fun new requirements, like time-based rules. The biggest change is that no points will be awarded for earning missions. You will still get a badge to recognize your accomplishments. Other than the Karma Credits (and you can only see your own), no points will be awarded on the new SAP Community. Rather than recognizing members by points, we will be introducing a scoring system. The scores will begin being calculated in the background at go-live, but won’t be rolled out publicly until it’s certain the activities and weights have been defined correctly, and enough time has passed that it is based on enough data to be reliable. Your reputation score is a representation of all the actions you take on the community, and the community’s appraisal of those actions. It reflects the value you contribute, and is calculated based on a weighted combination of the quality of your contributions, your community citizenship and your influence. As a replacement for space-specific point totals and Topic Leader recognition, we will rollout an expertise score. The designation of Expert and Knowledgeable will be given to members who reach a high threshold of quality contributions in a given topic primary tag. You will see your progress towards the threshold in any tag you’re active in. No one else will see your progress, but once you reach the threshold, the designation will be prominently displayed in your profile, for all primary tags you qualify in. At a given point in time, any member with a current status of Expert of Knowledgeable will be included and findable in our Expertise Showcase. This dynamic listing of Expert and Knowledgeable members will be searchable by tag, and provide an incredible resource of topic experts to the entire community. A permanent annual archive will also be available. We are excited to bring these innovations and improvements to the Reputation and Gamification Program. We fully acknowledge that these changes will affect our members in a real way, which is why we took a very user-centered approach to program design. We have worked over the last year with our esteemed Reputation Advisory Group, in an effort to ensure the direction reflected the concerns, hopes and experiences of our members. A great big thank you! Also, to our colleagues in IT and on the HCP Gamification Service team, thank you for collaborating and innovating with us. Innovations and improvements are need of the hour in today’s world.So is with our RGP. I am very much to see how Karma Credits & Karma Credits History going to work. Really excited to see the new reputation system in action soon and I hope that the community will like & embrace it! When is the new program being launched ? It’s very good one and welcome step. Will the activity on the WIKI also count for reputation/karma? Hi Caetano Almeida, wiki activity will not count towards reputation score or expertise scores. Karma credits is for activity on SAP Answers only. In light of the upcoming expertise and reputation scores (which make a lot of sense to me), and the macro goal of simplifying the platform, I am having difficulties seeing see what use karma points are. Since SAP Answers will be a new platform for the community, with a new feature in down-voting, and the scores are coming after the main go-live, we wanted to offer the karma credits total and log as a way for a member to get used to the platform, and have feedback on how their contributions are being received/evaluated by other members. We went with the member only view since we agree with you that the scores should be the priority. They may also play a role in the trusted member concept Gabi mentions here, „Can you please help me answer my question?” – The new era of Q&A on the new #1DXCOMMDEST, (still to be determined) and we think members will want to know where they stand. I am very interested to know what this means. “The value you contribute”? Calculated / determined how? “community citizenship“? I am not even sure what I must envision here, so I am not sure what I need to ask. “your influence“? Calculated / determined how? And if the calculation is a weighted combination of these three factors, then what is the reason that any of these three is more or less important than the others? Perhaps citizen will lead to refugee or alien? While we won’t disclose the specifics of the algorithm, the score will be based on a variety of measurable factors that are indicators of quality, citizenship and influence. The publicly displayed reputation score is a compound score; factors are weighted according to their importance to overall reputation. Members will have a member-only view of the sub scores that go into the compound score, which will be informative in terms of understanding where they have room for improvement. You should think of the citizenship score as a way of measuring if the member follows the Rules of Engagement and takes actions for the greater good of the community. One more question: as existing reputation will only be migrated as FYI, will everybody start off with a zero reputation on the new platform? Or will current contributions and/or reputation somehow be used to calculate a starting reputation? Everyone is beginning fresh. For the reputation score, everyone will start with a neutral score, and move up or down based on contributions in the new platform. (Qualifiers are: needs work, neutral, good, excellent (labels still to be vetted with UX). For the expertise score, which is primary tag based, the score begins calculating once you are active in a given primary tag. Similar to how with the topic leader contest, we reset at the beginning of each contest period, the expertise score will start calculating based on activities in the new platform. However unlike the topic leader contest, the expertise score is calculated on a rolling basis, achievement of expert or knowledgeable status is based on reaching a threshold, and there is no limit to how many members can earn either status in a primary tag (the topic leader contest allowed only three members per space). That brings another question to mind, is there any information anywhere about how this tag business works? I see what I assume is the primary tag in bold, however I cannot choose it. I can only choose a secondary tag. Or did you mean that reputation is gained by sub tag? Which makes me wonder if I can follow all sub tags based on the one bold primary tag? Johan Hakkesteegt – not that I want to hijack the thread, but you bring up an interesting point about tags, and one that has haunted me for many months. What is the overall plan for tags? Perhaps Caroleigh you could circulate this internally with the team and we could get a better picture for the post-launch gameplan for not only the tagging of migrated content and requiring tags for newly authored content, but also the post-launch needs of the community. We need better ways to use them to associate content, filter searches, and watch content like many of us are currently accustomed to doing with spaces. Right now it feels a lot more like adding attributes to an object but not a consistent overarching way to leverage them to find what community members need. Hi Jeremy, I will definitely share and re-iterate this feedback with the team. And we will share post-launch timing for new functionality and improvements as soon as we have it. Although the hierarchy is shown, in most cases you can only tag, and earn reputation, at Product Name level. Showing the hierarchy helps organize the view for easier tagging. You mean there won’t be an “Oh Great and Exhalted One” status? I wonder what the titles are for those who do not contribute enough or give too many incorrect answers. I Welcome the reloaded reputation program. The new release date for missions is to be determined. Hi Satyanarayana, Thank you for your interest. Timing is still to be determined while we work on other, higher priority items. We will provide an update once we have a firm date. I’ve earned three mission badges in the new reputation scheme but only two are publicly displayed on my profile. Is that intentional? If so, how can we control which earned mission badges are displayed? Hi Amy, We are experiencing an issue with the earned mission badges not getting pushed to the profile. We have a ticket open and our development team is working on it. As you’ve noticed, the issue started last week, which is why you see some badges in the profile, but not all. In the meantime, the My Missions page is the best place to check for progress. I hope it will be resolved soon and will post an updated when I know more. Thank you for your patience.